This design will rock your world. It's the perfect thing for travel accessories! If you just love adventures it will capture this adventurous spirit. This design will be sure to bring you happiness during your day. This design is a large world map. 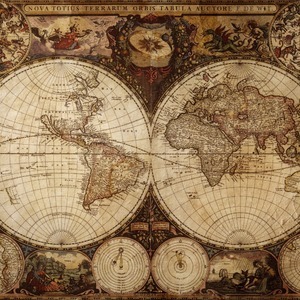 The map is a vintage style that looks antique. It is a beautiful combination of browns, oranges, and tans. This design is perfect for passport holders, luggage tags, and other related travel accessories. This design is not personalized, but you can easily add personalization if you like. In our design center you will find thousands of backgrounds to choose from. Find the perfect one to fit your personality. After you choose a background, add a graphic or text. Add whatever you like, just make it yours.